Thanks to advances in technology, dentures and partials don’t have to be uncomfortable or cause embarrassing moments anymore. Dr. McKnight can create comfortable dentures and partials that look natural and allow you to eat and speak with confidence, restoring your smile to its original beauty…only better. Missing teeth can make it difficult to eat or speak and cause the facial muscles to sag, changing your appearance and contributing to wrinkles. Luckily, dentures and partials fill out the oral cavity, making you look more youthful and supporting your oral structures for increased health and functionality. Most individuals who’ve lost all of their teeth experience health problems due to nutrition issues, but dentures restore your ability to eat with freedom, making it easier to maintain a healthy diet. 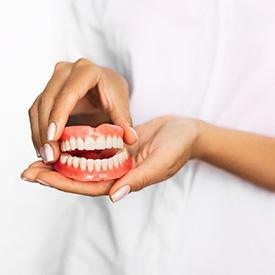 For those who’ve lost only a few teeth, partial dentures provide an alternative to crown and bridge or dental implants. We are pleased to announce the incorporation of AvaDent™ Digital Dentures into our practice. As one of a select number of dental practices to offer this breakthrough digital CAD / CAM technology, Dr. McKnight can now create an AvaDent Digital Denture with a precise fit in just two appointments. Traditional dentures can take as many as five or more appointments to make and still not give a patient the advantages found with AvaDent. The AvaDent process starts with one convenient record taking appointment to capture a patient’s exact features. This information is then sent to AvaDent’s Scottsdale, AZ facility where it is put into a computer and the denture is digitally designed and precision milled from a compressed, pre-shrunk disk of acrylic. In addition to the precision fit and two appointment convenience, AvaDents are more bacteria resistant than traditional fabricated dentures to help eliminate sore spots and “denture breath.” And, because AvaDents are digital, each one has a permanent digital record, so if they are ever lost or broken, they can be replaced quickly and easily without the patient even coming into the practice. If you have a denture that isn’t what you had hoped for, talk to Dr. McKnight about this amazing technology that can create the best fitting denture possible. Let Dr. McKnight assess your tooth loss situation and determine which replacement method—dentures, implants, or crown and bridge—is right for you.